In 2010, Abu Bakr al Rabeeah fled increasing Sunni/Shi’a tensions in his native Iraq, along with his parents, siblings, and members of his extended family. They sought refuge in Homs, Syria, where some relatives already lived. Unfortunately, they had fled right into the teeth of the Arab Spring, and the Assad regime’s crackdown on the uprisings inspired by the movement. The streets of Syria became war zones, as the state military fought with anti-government militias for control. Mosques were shot up, businesses were bombed, and schools exploded. 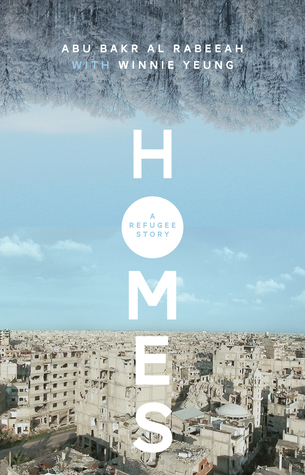 Homes is the story of the al Rabeeah family’s journey from Iraq to Syria and Syria to Canada, as told to Bakr’s English teacher, Winnie Yeung. Despite being a true story, Homes is written in the style of a novel, a work of creative non-fiction recounting the memories of Bakr and his family, based on interviews given to Winnie Yeung. It is both simply written, and yet striking. Little details, such as the word “first,” become particularly poignant, as Bakr describes his “first car bomb” or his “first massacre,” things you hope to live a lifetime without seeing, let alone more than once while still in elementary school. Bakr’s childhood is full of such events, so common they become almost mundane, even as the trauma continues to mount. Juxtaposed against the horrors of the civil war are the ordinary rhythms of the family’s daily life in Syria. Bakr and his sibling must still go to school when it is open. He plays soccer with his friends and cousins. Not really knowing any better, he and one of his cousins amuse themselves by collecting spent bullet casings, without considering the lives those bullets may have taken. The families celebrate Ramadan, and continue to attend mosque, despite the risk of another shooting. His father and older brother run a bakery, selling his mother’s recipe for soft, chewy Iraqi bread, a contrast to the dryer pita-style bread more commonly found in Homs. Life goes on with the illusion of normalcy, until it is shattered again by the next attack. As the story moves to Canada, Homes also conveys the profound loneliness of leaving everyone you know, and everything you love, behind for a new country where you do not even speak the language. From business owner of a bakery, Bakr’s father is reduced to taking English classes, unable to care for his family in the manner to which he is accustomed. A better life has been promised, but when will it materialize? It is a blessing to be safe, but into the void of fearing for one’s life, new anxieties gather to take its place. Homes ends here, but in many ways, the al Rabeeah family’s journey has only just begun its next chapter. Homes was defended on Canada Reads 2019 by musician Chuck Comeau, whose quiet debate style emphasized love, family, and hope. He particularly highlighted the father-son relationship, as well as the partnership between Bakr and his teacher that brought the book into being, first as an after school project, and then as a published work. He also emphasized that fact that it is essential for Western culture to have more positive portrayals of Muslim people, rather than only seeing them as stock character terrorists in film and television. Homes received one strike on Day Two from Lisa Ray, and one vote against it from Ziya Tong on Day One, who said it was too much like her own book, but otherwise it moved through the week unscathed. Indeed, Homes slid quietly into the finale to go head to head with By Chance Alone, which Tong was defending. Discussion on the final day of Canada Reads 2019 ranged over several questions, including what each of the remaining books helped panelists to understand, why the free agents should vote against their opponents’ books, and whether or not the books could move Canadians to action. Many of the panelists brought up the relative ages of the two authors. While both were writing about their youth, one is still a teen, and the other is a nonagenarian, representing both ends of the life spectrum. It was pointed out that the voices of both the youth and the elderly can be discounted by society at large. When it came time to vote, Ziya Tong of course voted against Homes, and Chuck Comeau against By Chance Alone. The three free agents cast their ballots, with Joe Zee voting against Homes, saying that he was persuaded by the argument that Holocaust voices are fading. Lisa Ray voted against By Chance Alone, saying that Homes was the book she wanted all of Canada to read. This put the final vote in the hands of Yanic Truesdale, who had previously voted twice against By Chance Alone. In a surprise change of heart, Truesdale cast his final ballot against Homes, also citing the argument that the voices of Holocaust survivors will soon be gone. Thus, By Chance Alone by Max Eisen was crowned the winner of Canada Reads 2019. Catch up on Days One, Two, and Three of the debates, and check back tomorrow for my review of the winner!